Hidden divergence is similar to 'standard' divergence – where the price of an asset and an indicator move in opposite directions. However, while regular divergence can alert you ahead of time to a possible reversal, or change in the price direction, hidden divergence can tell you ahead of time when a trend looks set to continue. Hidden divergence can tell you ahead of time when a trend looks set to continue. This allows you to enter a trend when it still has further to run. To find signs of hidden divergence and the possible continuation of a trend, you first need to choose an indicator to use and to identify that a trend is taking place. 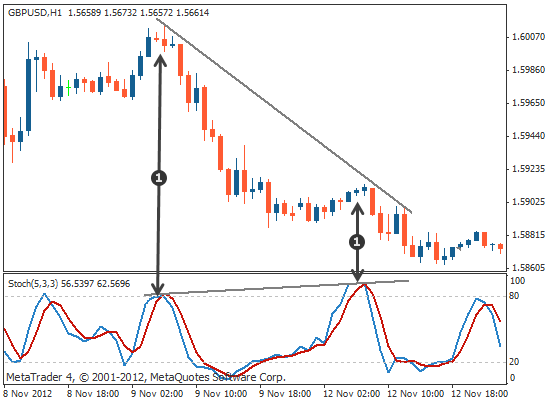 Common indicators to use are the stochastic indicator, the MACD and the OsMA. 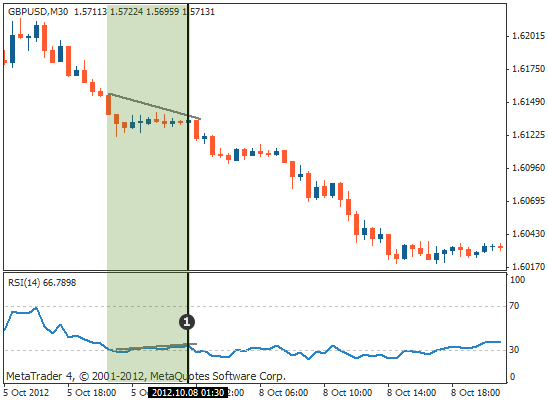 However, almost all indicators can be used to find divergence. Throughout this lesson, we will show you different examples using different indicators. If the price of an asset makes a series of higher lows, this can denote an uptrend is underway. 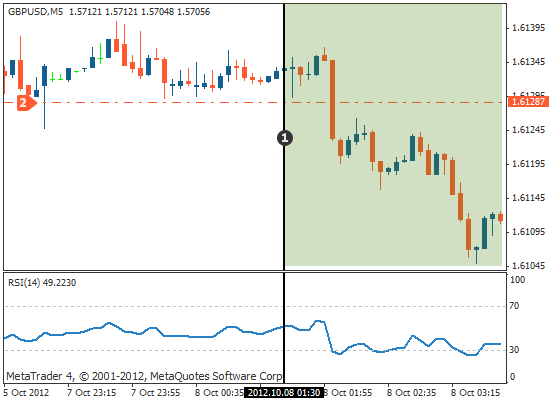 If you spot that the indicator has at the same time made a series of lower lows, you have identified hidden divergence. In this case, it suggests that the uptrend will continue and you could choose to go long, or buy, the asset. You can see that both the price is making a higher low, whilst the indicator is making a lower low. This means that the price is set to continue up. If the price of an asset makes a series of lower highs, this can indicate that a downtrend is underway. If you spot that the indicator has at the same time made a series of higher highs, you have identified hidden divergence. In this case, it suggests that the downtrend will continue and you could choose to go short, or sell, the asset. You can see in the chart that the price is making a lower high, whilst the indicator is making a higher high. 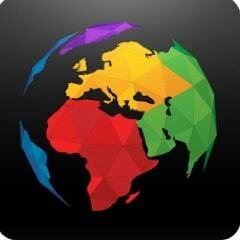 This indicates that the price is set to continue down. 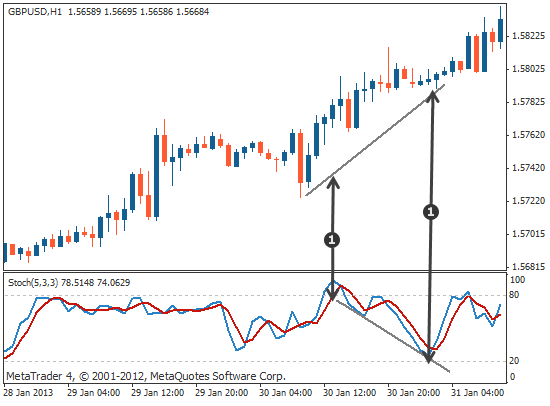 Identifying hidden divergence takes practice and it is recommended that new traders focus on standard divergence first. You can then incorporate hidden divergence into your trading at a later date. Hidden divergence can help you enter into a trend. It should always be used as part of a wider trading strategy though, which will define your entry, stop loss and profit target. The higher the time frame that you use to look for hidden divergence, the longer it can take for the trend continuation to actually happen. Because of this, hidden divergence tends to work best over longer time frames. Although it can also work with shorter time frames, be careful – by the time you have spotted hidden divergence the continuation of the trend may already have occurred and completed. Hidden divergence tends to work best over longer time frames. With short time frames, by the time you have spotted hidden divergence, the trend may already have completed. Hidden divergence can work well with multiple time frame analysis. For example, you could look for hidden divergence to identify a trend continuation on a higher time frame, but use a lower time frame to choose an entry point. The highlighted area shows where the hidden divergence has occurred on a 30 minute chart signalling a continuation of the down move. You can use the 5 minute chart to look for an entry in the same direction as the continuation. The line at which the hidden divergence was confirmed on the 30 minute chart. Short trade initiated once the price broke through the support level in the recent range. … hidden divergence is similar to standard divergence – where the price of an asset and an indicator move in opposite directions. … it can tell you ahead of time when a trend looks set to continue, allowing you to enter a trend when it still has some time to run. … if the price of an asset makes a series of higher lows but the indicator makes a series of lower lows, this suggests the price’s uptrend will continue. … if the price of an asset makes a series of lower highs but the indicator makes a series of higher highs, this suggests the downtrend will continue. … identifying hidden divergence takes practice and it is recommended that new traders focus on standard divergence first. … hidden divergence should always be used as part of a wider trading strategy, which will define your entry, stop loss and profit target. … it tends to work best over longer time frames – with short time frames, by the time you have spotted hidden divergence, the trend continuation may already have completed. … it can however work well with multiple time frame analysis – looking for hidden divergence to identify a trend continuation on a higher time frame but using a lower time frame to choose an entry point.